In this video, you will learn how to do a dilation and graph the new image. Dilation: Transformation of an image that is different in size but proportionate to the original figure. 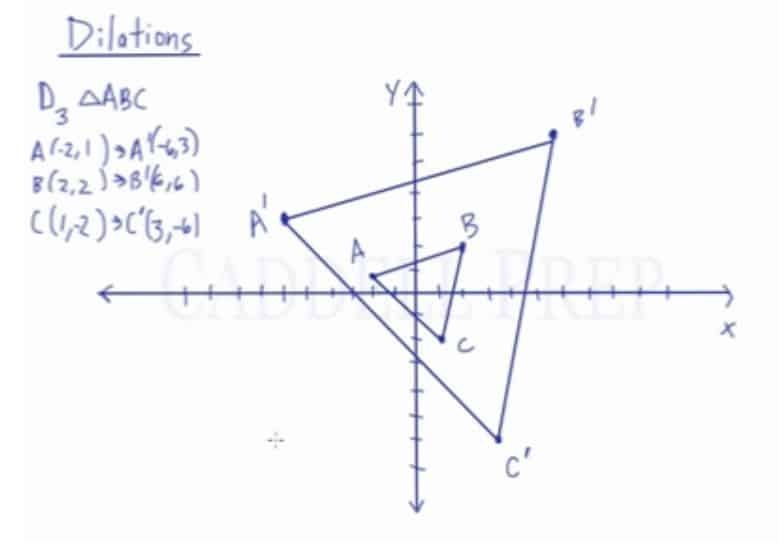 Apply a dilation by a scale factor of 3 to triangle ABC with coordinate points of A(-2,1), B(2,2), and C(1,-2) with the center located at the origin. Using the dilation notation and the scale factor of 3, we can easily determine the coordinate points of the image by multiplying the x-value by k and the y-value by k.
Dilations are denoted by capital letter with some number before whatever it is we’re dilating. This is our factor of dilation or also known as scaled factor. When we do the scale factor, we just have to multiply all the coordinates by that scale factor. We can see that dilation resulted in a larger coordinate. A larger value and a larger value. Here, the numbers went down. When we dilate a shape, if is bigger than such as , the shape is going to be bigger. But if the scale factor is less than such as , then the shape is going to be smaller. Let’s take this triangle and dialte it with a scale factor of . Let’s first write down our coordinates. We just multiplied all coordinates by . This is what triangle look like if we have a scale factor of . We just simply multiplied the and coordinates by the scale factor of . Also, is bigger than so we expect that the triangle will be bigger. If the scale factor is less than then the triangle will be smaller than the original, depending on what the scale factor is.